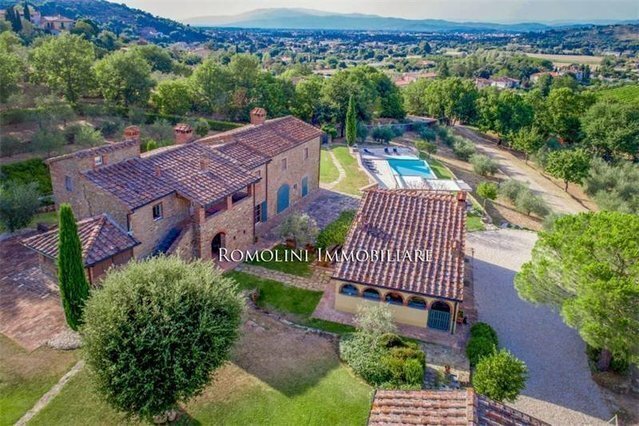 In the province of Arezzo, really close to a small village providing all the services, this wonderful farmhouse with its 610 sqm of surface and 5 bedrooms is perfect for whoever is looking for a private residence or a starting point for a hosting business provided with a high degree of privacy. Further enriching the property we can find an 11 x 5 m swimming pool tiled in travertine and pietra serena, a well-maintained garden and a small olive grove. GEOGRAPHIC POSITIONOn the hills of the Aretine countryside, a short distance from a small town providing all the necessary services, finely restored farmhouse with swimming pool, dependance and land.Easily accessed and i a not-too-isolated location, the farmhouse grants a quick access to the nearby village (1km; 5rsquo;) and all the most renowned towns of Tuscany: Arezzo (5km; 15rsquo;), the medieval Castiglion Fiorentino (18km; 25rsquo;), the Etruscan Cortona (30km; 40rsquo;), the wine-city of Montepulciano (52km; 50rsquo;), the papal Pienza (58km; 1h), Siena (72km; 1h 10rsquo;), Montalcino (73km; 1h 20rsquo;) and obviously the Renaissance Florence (78km; 1h 15rsquo;).The nearest airports are Perugia Santrsquo;Egidio (90km; 1h 10rsquo;), Firenze Peretola (96km; 1h 5rsquo;), Pisa Galilei (158km; 1h 50rsquo;), Bologna Marconi (179km; 2h), Roma Ciampino (230km; 2h 25rsquo;) and Roma Fiumicino (245km; 2h 25rsquo;).DESCRIPTION OF THE BUILDINGSThe property is made up of two buildings: a manor house and a dependance.The main farmhouse (450 sqm ndash; 4,842 sqft) is laid out onto two floors: on the ground floor we find a habitable kitchen, a laundry room, a dining room, a small bathroom, a sitting room, a studio, a fully equipped gym, a sauna and a cellar to stock wine and oil. Mounting to the first floor we find the night-zone made up of three double bedrooms (each with an en-suite bathroom, one with a whirlwind tub) and enriched by a panoramic terrace.The dependance (160 sqm ndash; 1,722 sqft) is also split between two floors: on the ground floor we find a kitchen, a living room, a small cellar and a bathroom (which could be turned into a laundry room). Up on the first floor there is the night zone with two double bedrooms and a bathroom.A garage (48 sqm ndash; 516 sqft) offers a useful shelter for up to 4 cars.STATE AND FINISHESThe property has been finely restored and all the relevant traits of Tuscan countryside buildings have been attentively preserved: external stone and masonry walls of the main farmhouse have been fully restored and are now in excellent conditions and the masonry wall of the dependance are in good conditions too.Even on the inside we managed to preserve the rustic appearance of the building, without using modern materials and preserving the beautiful wooden beams. Floors are all tiled with high quality materials ranging from ancient terracotta, cleaned and repositioned, to a more modern terracotta and parquet of some rooms. Walls mainly plastered and painted with not-too-showy colors, but some stone sections are still visible, as well as brick-built arches linking the rooms in the day-zone.EXTERNAL AREABuildings are surrounded by one hectare of land, split between garden and olive grove. The property is fenced with stone walls and metal fences decorated by laurel trees, strawberry trees and sagebrushes. The small olive grove grants a reasonable production of olives which can be used to obtain a small quantity of oil for private use.On the garden we can also find a beautiful 11 x 5 m swimming pool, entirely covered in travertine and pietra serena and equipped with a gazebo and a dressing room with shower.Still on the garden there is a nice gazebo equipped with kitchen, wood oven and BBQ which makes it particularly viable for al fresco dining in company.A small wooden shed (30 sqm ndash; 323 sqft) grants shelter for the tools used to take care of the garden and the olive grove.USE AND POTENTIAL USESThe property, with its nice size and its high quality finishes, it is perfect as a luxury private residence in a quiet and undisturbed location, granting a high level of privacy. The presence of five bedrooms opens up the possibility of starting a small Bamp;B-like business, thanks also to the pool and the gym, two bonus very much appreciated by tourists and vacationers.